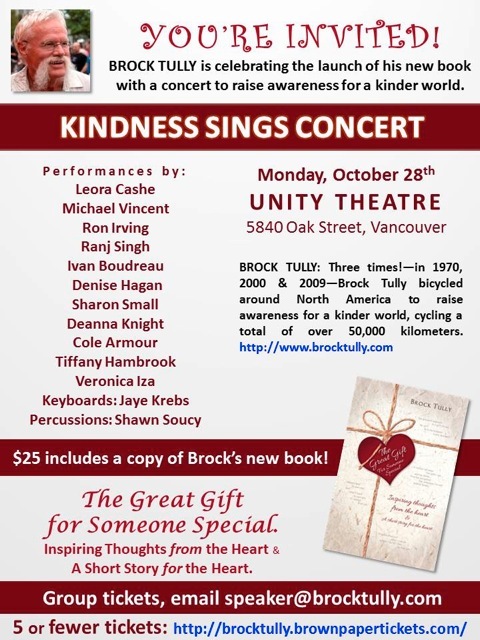 Brock’s Book Launch and Kindness Sings Concert on Monday,October 28 @ Unity Theatre on Oak St. at 49th Ave!…i’m launching my new book and i’d LOVE to see you there! (very exciting!! :-) – it will be combined with a ‘Concert’ to raise awareness for a KINDER world, with many of the amazing performers from the World Kindness Concert – “Brock’s Book Launch & Kindness Sings Concert”! Just click the link for more details and to see a preview of the exciting cover of my new book “The Great Gift…for someone special”, as well as to purchase tickets: http://brocktully.brownpapertickets.com/ – also to see performers, venue, time, date, cost, etc. – AN AMAZING DEAL! Tickets are ONLY $25 and include a free copy of my new book (a $20 value!). Seating is limited, so buy your tickets early! Tickets can be purchased online via the link above or by calling Brown Paper Tickets toll free at 1-800-838-1006. – i have a group ticket price – not for you to get a special deal, as i’ve kept the ticket price low so everyone can come, but for those who can pay a little more to help cover many costs. 10 tickets – $250 – regular price with no taxes added. …i’m speaking at an event soon!